You can't hear most of them, but the world is running on different kinds of mechanical oscillations. For example, inside the average electronic wristwatch is a sealed canister containing a 3 mm long quartz crystal resonator. In response to electrical feedback, the crystal continuously vibrates about 33,000 times per second. The remarkable stability of that resonance frequency, which provides the clock's "tick" rate, keeps you on time. "But in today's rush to make smaller, lighter devices, space on the printed circuit board is very valuable, and quartz crystals are large, expensive, and fragile," says Jason Gorman of NIST's Physical Measurement Laboratory. "So, over the past 10 years there has been a push to make microscale clocks, with a focus on silicon resonators. The goal is to develop microscale clocks that surpass quartz clocks in performance while also being 1/100th the size and using a fraction of the power." In pursuit of that goal, Gorman and colleague Vikrant Gokhale – using custom-fabricated structures no larger than one-fifth the width of a human hair—have devised and tested a novel method that substantially improves silicon resonator performance, and may also benefit many different types of sensors. The scientists published their results recently in Applied Physics Letters . Clocks require some mechanism that oscillates (ticks) at almost exactly the same rate and strength over time, whether it is a swinging pendulum or atoms absorbing and releasing photons. A resonator's ability to do so precisely is directly related to its quality factor (Q). A high-Q resonator is one that stays close to a single frequency and bleeds off very little energy to its surroundings; its signal remains strong and stable over time. 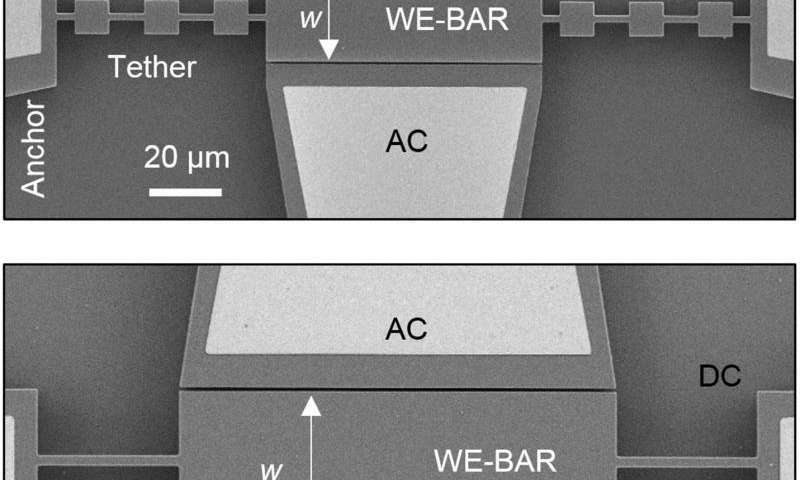 In microscale devices – fabricated at dimensions measured in micrometers – a key factor for the achievable Q is the amount of vibrational energy absorbed by the tiny buttresses or "tethers" that suspend the resonator from the supporting substrate. Tethers are designed to reflect as much of the vibrational energy as possible back to the resonator, minimizing dissipation. The standard configuration for a tether is just a straight beam of solid silicon. Recently, other researchers have employed tethers with more complex structure based on repeating geometry. Depending on the optimization of this geometry, these tethers can allow only certain frequencies of quantized vibrations called phonons to pass through while reflecting others back. (This is called an acoustic bandgap.) Thus, an ideal "phononic crystal" (PnC) tether would reflect the resonator's resonance frequency, while transmitting others. "Since more vibrational energy is confined within the resonator due to reflections off of the phononic crystal, the quality factor is expected to improve compared to straight-beam tethers," says Gokhale. Early experiments with PnCs in different tether configurations by others showed that the quality factor could be improved by as much as a factor three. However, other energy dissipation mechanisms, such as stress at the interfaces between multiple materials and thermoelastic dissipation in metal electrodes, dominated the quality factor in the piezoelectric resonators used in these tests. "We decided to take that further," Gorman says. "We knew that by developing a resonator made of a single material, silicon in this case, we could get rid of most of the other dissipation mechanisms that limit the quality factor." Doing so reduced the dissipation to just a few effects that are unavoidable and small compared to the energy dissipation typically resulting from tethers. 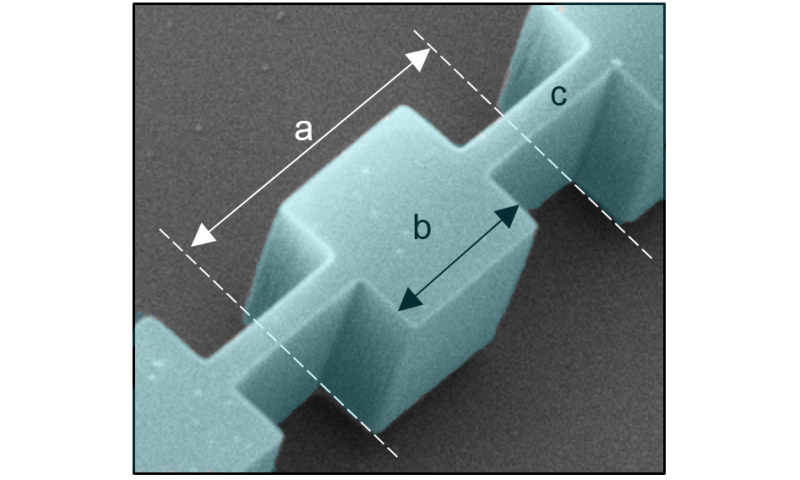 Using the nanofabrication capabilities of NIST's Center for Nanoscale Science and Technology, they made tether arrays in rows containing one, three, or five PnC "cells," and determined that larger numbers increased the reflectance, and thus improved the Q. The results not only far surpassed the performance of conventional tether bars, but approached the fundamental limit of intrinsic dissipation for the material, achieving higher Q than ever before recorded for silicon at a resonance frequency above 100 MHz. In addition to micromechanical clocks, this work may have repercussions on a number of sensor approaches based on resonators. "Resonant sensors are commonly used for sensitive measurements of acceleration, rotation, force, and mass changes, and the sensitivity is proportional to the achievable Q," says Gorman. As an example, resonant chemical sensors rely on the fact that a resonator's center frequency depends on its mass. If a molecule of some kind – such as a pollutant – hits the resonator and sticks there, it changes the resonance frequency. The amount of change depends on the mass of the molecule, allowing users to determine the chemical species. "High Q matters in sensors because it improves the sensitivity to changes in the resonance frequency when a stimulus is applied to the resonator," Gokhale says. New sensor technologies based on the resonator with phononic crystal tethers are now being pursued.